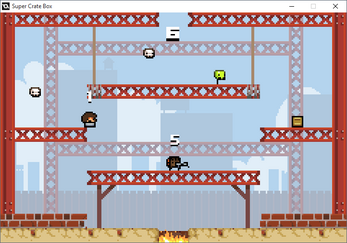 This is a Super Crate Box mod that introduces local and online multiplayer modes with support for up to 4 players. The source code was obtained via Humble Bundle. 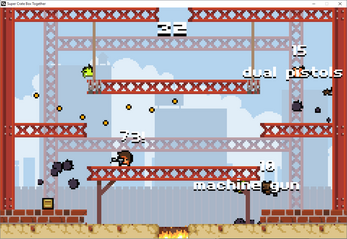 Multiplayer-related code was heavily reused from my existing projects. A somewhat-stable internet connection and latencies under 100ms are highly recommended for playing online. Online multiplayer requires port forwarding. This requirement may be lifted in the future updates. At the time there are no Mac/Linux versions but the game should run well enough via Wine/Crossover. 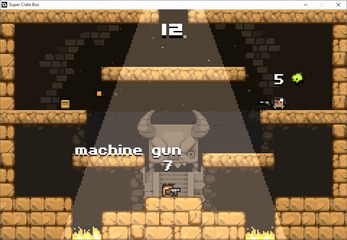 This is a free user-created mod that is not affiliated with Vlambeer. Donations (if any) go towards producing more multiplayer games and experiments. Given that this mod is rather experimental, you may encounter bugs or problems. Do tell if something breaks. i really want the source code and cant find it from the link you provided please help?. Actually! I donated to that bundle. I may have the source, but I probably don't have permission to distribute it. Hello! IP address to use is shown in Hamachi itself. IIRC you can also right-click on the user in network and pick "copy IP". So one player would host the game while being on the network and the rest would use that as IP/Address to connect to them. Omggg, thank you so much :( We will try that tomorrow. Do you mind if I ask one more question? Because I am not sure if I fully understood. Let's say we are both connected to a network on hamachi. When I host, the game says I need a port. Now I know what address she should use to join, but the port? Where can I find it? We found so many different answers online we have no idea what to use :( And after I host, do I start playing the game immediately and when she joins she'll just show up as a character? Or do I have to wait for her at the starting screen? Thank you so much for your time so far, I really appreciate it, I am sorry if the questions seem a little silly. Looking forward to playing your games soon! You set the port yourself (with Hamachi, default should work) and then the person connecting would specify the same port (so tell them which one you picked). So you set the port on "Host" screen, pick Start (and get a player list screen), then the person joins (and shows up on player list), and then you pick Start to get into the actual game. Does this require Super Crate Box? It doesn't - Super Crate Box is freeware so this is just a standalone mod for everyone's convenience. See this reply - the game doesn't detect gamepads as such, it just loads whatever control schemes that are defined in a file, so you'd need to add two more to there. Is there any chance that you are able to remove the fact that the host has to set the input delay to the person with the highest ping? Potentially at some point of future, but generally fancier lag compensation methods are a little out of scope for freeware mods. Current implementation relies on delay to not have to directly transmit ever-increasing number of enemies (causing issues for players with poor connection in process). I'd probably try to do things differently nowadays. Im trying to play online with my friend yet it always say that the connection timed out, any thoughts? You will usually have to port forward (look that up) unless you use software that simulates a local network (such as Evolve, Tunngle, or Hamachi). I can't remember if the game starts in full-screen, but try Alt+Enter? Or set it to run in Win8 compatibility mode via file properties. This is a strange question, but are you sure that it's 60fps? I just checked locally and Steam overlay says that it's 60fps, but in-game values still report 50fps, and it doesn't seem to be faster or smoother than SCBT. That's... an interesting question. 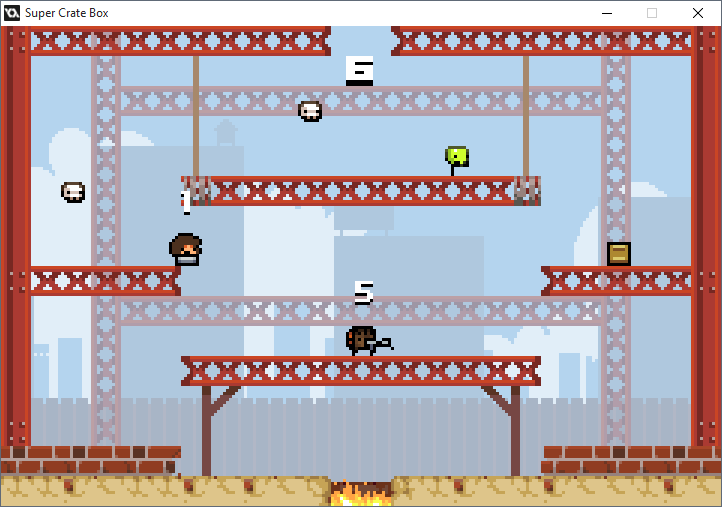 I think auto-jump may have gotten lost in spacetime while I was tweaking something jump-related (at one point had added the ability to jump a few frames after dropping off platforms, ala Spelunky). Perhaps in a future version. Hmm... perhaps assuming that the game would work fine after 3 months worth of software updates wasn't a wise plan. What did you do prior to the error appearing? Edit: Okay, seems like the error occurs only in non-debug versions of the game on players joining. This will be fun. The error happened when we tried to connect to each other. The ports were fine and such but in many occasions the above error popped up, or the game ends up crashing. It turns out that `[@]` array read operator (`myvar = array[@index]`) is completely broken in GameMaker, just returning 0 both if reading out of bounds and if applied to something that isn't an array at all. Previously I was lucky (or careful enough) to not have made any missteps with this (thus not even knowing of this behaviour), but somewhere in the recent changes a bug was introduced, so GM' runner gets a 0 instead of showing an error, then it passes 0 as the index to one or other data structure management functions, and then everything spectacularly explodes before you could even blink. I've re-enabled an older (working) version of the game for now while I'm looking over the game code to change everything to use `` operator for reading so that I can locate the actual source of problem. Do you have the source available? I was on and off working on a two player Super Crate Box since the source became available and just found this. I want to see how you've done it. Thanks! 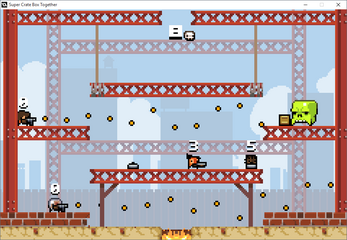 This is based on Humble Bundle version of the game source code. The source for my edited version currently is not available (quite rushed, and, as it turns out, largely working by series of coincidences), and it doesn't seem to be legal to redistribute the edited sources for anything from the bundle but Spelunky (which was already open-source). 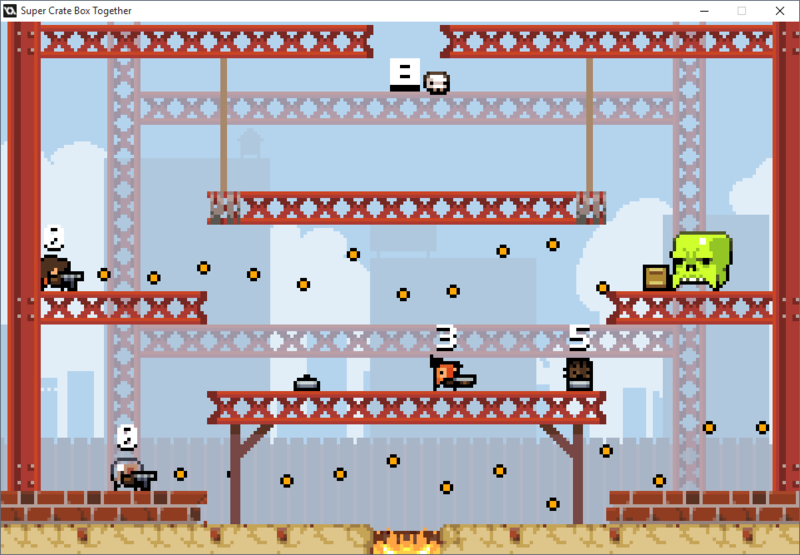 But basically, for local multiplayer, you just need to have each projectile store the ID of the player that fired it, and change things like "Player.x" to get that from the correct player (nearest for AI, owner for bullets, all for conditions). 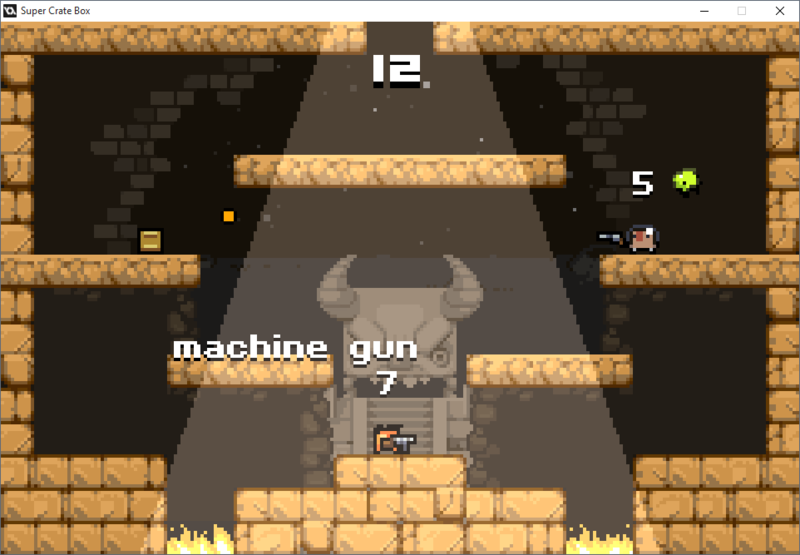 Then it's just lots of small edits like making laser guns not fly out of all players when firing. I ended up changing a substantial amount of code in the game, but that was largely related to online multiplayer, and unneeded if that is not your goal. God bless you and the internet.